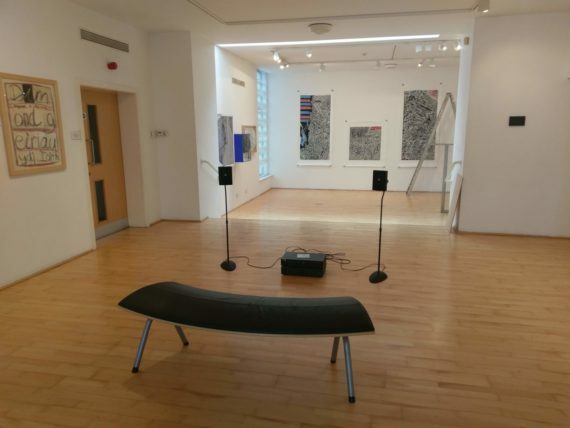 Dyfodiaith - Future language Tafod Dadweirlled - Metamorphosing tongue This research period will help develop a narrative, which imagines speaking to an unknown future; it will be developed into a new script that will serve as the basis of a new sound work. What language will we speak in the future? How will it sound and what will it look like? Imagine a strange isolated island, where the Brythonic language has remained alive, evolving throughout the centuries into something strange and unfamiliar. 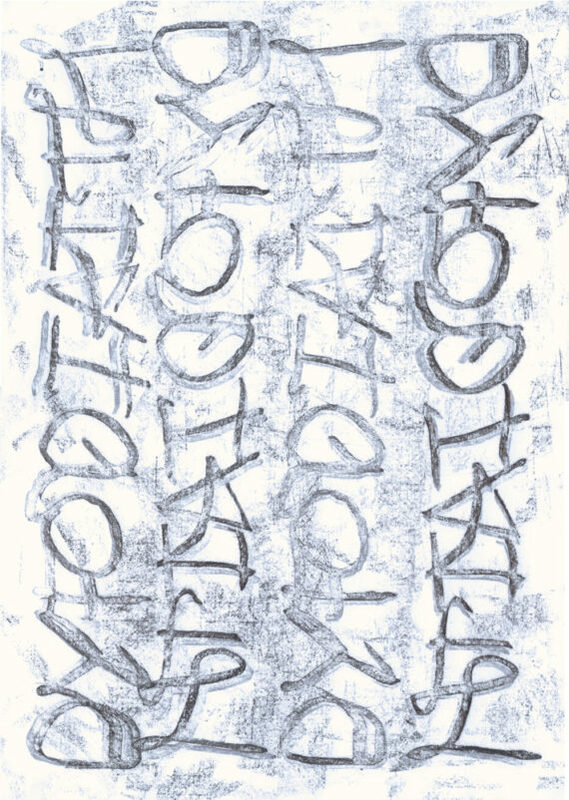 The project will work closely with a linguist to develop this speculative future language (dyfodiaith). The concept was inspired by the Welsh language novel ‘Ebargofiant’ by Jerry Hunter and ‘Wythnos Yng Nghymru Fydd’ by Islwyn Ffowc Elis. 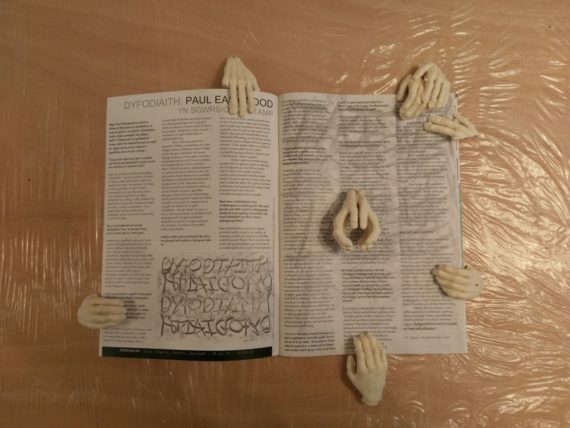 In a wider context Dyfodiaith goes towards trying to create a meaningful dialogue around arts production in the Welsh language. ‘Dyfodiaith’s vocabulary’ – narrative, syntax and handwriting. Dyfodiaith is inspired by George Orwell’s Newspeak from his dystopian novel ‘1984’ (1949), ‘Anglish/New-English’ and ‘Nadsat’ Russian influenced English used by teenagers in Anthony Burgess’s novel ‘A clockwork Orange’ (1962). The main aim of the project is to explore how language has the potential to control your thoughts and actions by the lexis we employ and how we might attempt to communicate to a future that hasn’t yet happened. This period of reserch will revolve around these two micro narratives. Working with a linguist I will aim to invent and appropriate up to 200 new words to help create the script. It will employ a portmanteau style approach to creating new words by combining existing ones. This will include looking at regional dialects and lexis, specifically indigenous languages from the British isles and Ireland, and codified language from subculture and cinema e.g Polari and Nadsat. I was invited to participate in a group exhibition at Bay Art by Iwan Bala. The exhibition explored notions of identity and culture through language. Llŷr and I were able to offer a short summary about the research and outcomes during the exhibition, which coincided with the National Eisteddfod Festival. 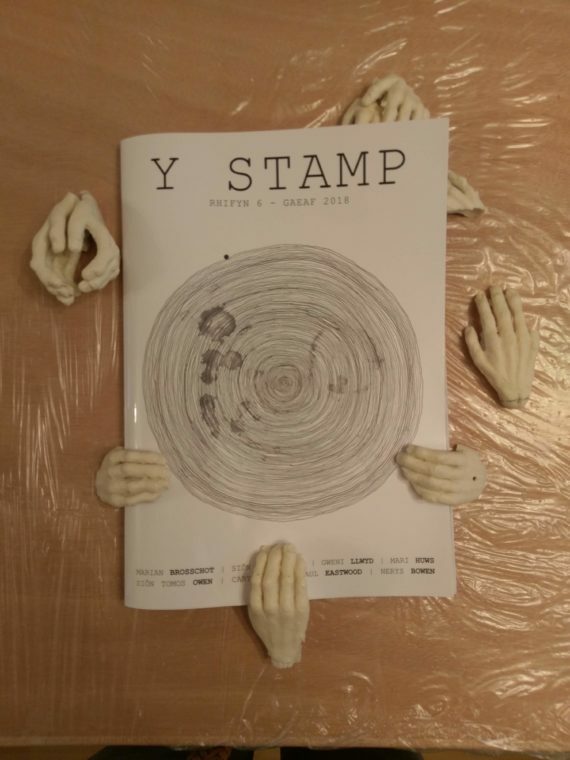 After the Festival Llŷr and I were able to write an introduction to our research methodologies and final out come in the Welsh language journal ‘Y Stamp’. 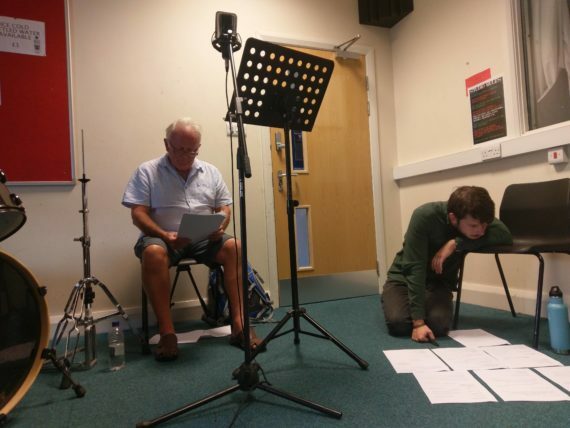 We used the Sound recording studio at the Vic, Wrexham. 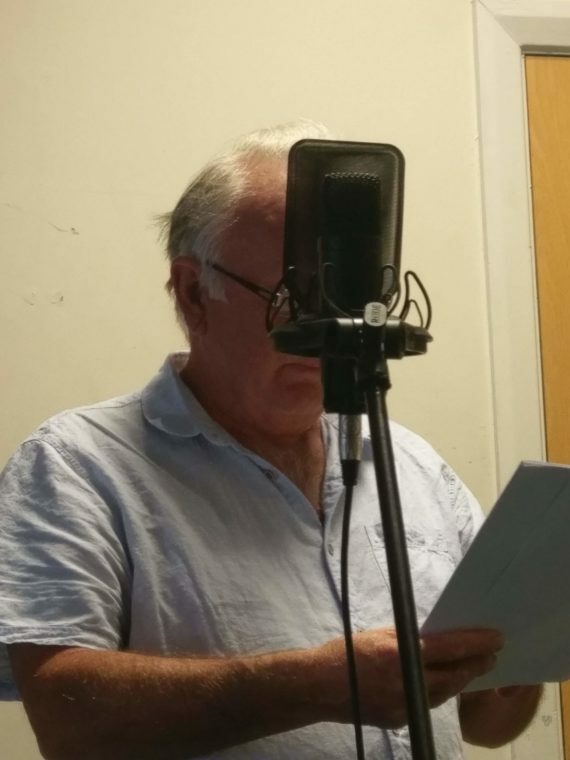 We approached the actor Wyn Bowen Harries to read the script. We discussed approaches to the reading and asked Wyn to bring some acting methodologies to the rehearsal to be able to find an appropriate style of oration / performance. 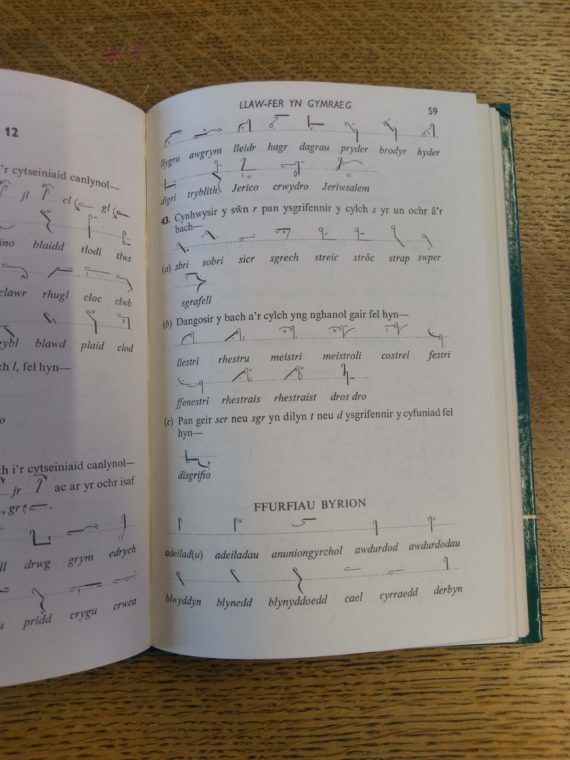 The script contained more than several hundred-foot notes to help Wyn decipher a large proportion of the vocabulary we employed and the etymology. We spent a considerable amount of time deciding and discussing relevant pronunciation for words that might not have been spoken for several centuries. We also employed the pronunciations of words appropriated from other related Celtic languages. Where possible we never used the same word twice and searched for similarities in word construction from related Celtic languages to portray the similarities between the languages and also show how these words might have evolved throughout the centuries. 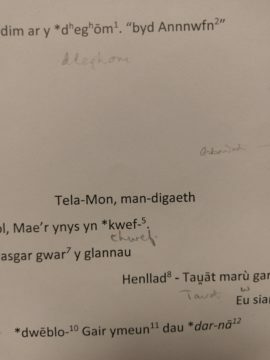 Alternative spelling to commonly used words in contemporary Welsh language also enabled us to explore varying degrees of pronunciation and intonation. 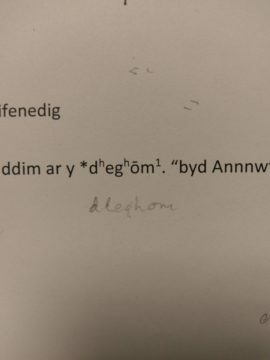 Pulling ideas from Pitman’s short hand in Welsh language. Writing approaches / monologues and script writing. I wrote a rough first draft script during the Litmus residency I undertook at Oriel Davies, Newtown. I used this collection of writing / scribbles to make a new sound recording with accompanying sound scape made by the Composer Samuel Barnes during the ‘Experimentica’ festival, Chapter gallery. These two bodies of research helped me organise my approaches to writing with Llyr on this research project. ‘Arwynebedd – Ar wyneb bedd’ ( Translation – ‘surface area – on the face of the grave’ ) An element of poetics and repetition is lost in translation. All these things built up the approach we took when writing this speculative language. Speaking from a present position towards an unknown future and audience. I was particularly interested in using Science Fiction genre as a means to propel the narrative of the script and think about minority languages outside of their original context. As the research and writing progressed, inventing words became secondary to our approach and the reintroduction of obsolete and archaic spelling became crucial to how we employed our findings. I approached the Welsh language department at Bangor University about my research project and made inquiries about supporting the work. I was fortunate to make an appointment with Professor Jerry Hunter, whose novel ‘Ebargofiant’ inspired the beginnings of my research. During my appointment with Professor Hunter. He suggested I contact one of his PhD Students, Llŷr Titus, about assisting me. I wanted to employ the support of an academic interested in Celtic languages. Durning an extensive period of research, Llŷrand I, were able to meet on several occasions to share ideas and working methodologies towards creating a fictional future language. We soon realised the depth and richness of the Welsh language, and found it difficult to invent new words as there were so many potentially from obsolete and archaic words that are no longer used in contemporary vocabulary. National Library of Wales online archive. I was drawn to exploring minority British languages as a way of searching for alternative viewpoint and different modes of storytelling. Especially when trying to deal with contemporary issues around identity and culture. How words and sentences don’t always easily translate. Llŷr and I had the opportunity to meet with the Linguistic, Professor David Crystal. During our meeting, Professor Crystal talked about Beowulf and kennings, a method of description in Anglo Saxon e.g. Whale Path = sea. This gave us an alternative approach to building word structure.